Thank you for considering us for all of your pet’s needs. Please have dogs on leashes and cats in carriers for the safety of your pets and others. Walk-in appointments are welcome at our veterinary clinic, but scheduled appointments are preferred. We do try to get to everyone in a timely manner, but emergencies and surgical procedures take priority, and occasionally delays do happen. We do require current vaccinations for our grooming, surgical, and boarding patients for the safety of every pet in the facility. Bring any previous health records for your pet including; vaccination history, previous diagnoses, blood test, and radiographs. To save time please fill out and sign our New Client Form to expedite check-in. As a minimum we do recommend that pets be seen for a full physical exam once a year at a verified pet hospital. This usually coordinates with annual vaccinations and intestinal parasite deworming. For an older pet we recommend yearly blood test as well. Payment is due at time of service. We accept all major debit and credit cards, cash, check, and carecredit. 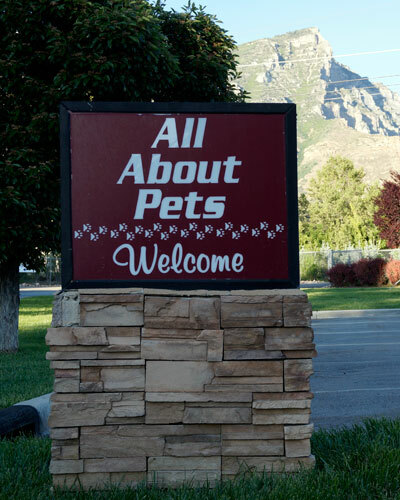 All About Pets is AAHA accredited veterinary practice with over 50 years of combined doctor experience. We provide excellent service and have had a friendly staff for 27 years.